This book is a practical tutorial approaching the topic with clear instructions and examples. With easy to understand examples and scenarios you can apply almost anywhere, this book walks you through both local and external data storage methods for the Android platform. "Android Database Programming" targets developers who are experienced with databases and other back-end design concepts, but who may want to see these concepts applied to mobile applications. Developers who are experienced with mobile applications and/or the Android platform, but who may not be as familiar with back-end systems and designing/implementing database schemas will find this tutorial equally useful. 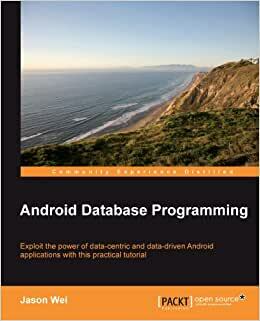 Even if you are already experienced with both Android programming and database implementation, but want to further solidify concepts and see a broader scope of data storage methods on Android, this book is your perfect companion. Jason Wei (http://thinkandroid.wordpress.com/) is currently a student at Stanford University, majoring in Mathematical Computational Science (MCS). He got involved with Android while interning at BillShrink, Inc. (http://www.billshrink.com), and since then has taken up an interest in making his own little Android apps. This book covers files (internal and external storage), shared preferences, and SQL Lite. This books title should have been "Android Data Storage and Retrieval" because SQL Lite coverage is not a major aspect nor the other DB's that are briefly discussed. Coverage of SQL Lite for an Android beginner will get you there but it's light in details on performance beyond simply timing sql statements against the same functionality in Java. Why would you show me a few different ways of querying the DB and not show me metrics of each when you're showing me a metric of using aggregate functions in the sql statement versus doing it in Java code? Also the book states that foreign keys are not allowed but the sqlite.org web site says they are so this may be a version issue. One MAJOR ISSUE I have with the kindle version is that there is no TOC on the left in the PC kindle version. I really hate this and there are many people that do as well. It seems to be a crap shoot with kindle books these days. Full of typo's in the text and also in the coding.Around 15 found in the first 35 pages and didn't even read the blurb at the start. My main problem was that it didn't address how to input and out put the data to the android device it only shoed how to hardcode the information in and that is not going to be used often on most applications. If you already know how to write java to input your data to the database and how to display the data that you require to retrieve this will show you how to build a database and how to query it but not how to show that information on the device. this book isn't written very well. the book seems like its just a compilation of someones notes of a bigger book. there are quite a few typos and errors in the code that, if you don't have a background in SQL maybe would be a issue. I purchased this book mostly for instruction on how to deal with blob objects (which ended up not being in the book) but also for the section on web scraping.. so hopefully there will be some good information when i get that far... over all not the best book from this publisher who normally is one of my first places to look for programming books. 2.0 颗星，最多 5 颗星VERY disappointing! A number of *important* items are not covered at all in this book. Also, for items that are covered, they are not given a very in depth treatment. Some elements of the book are disconnected and are difficult to put together. At least one item was simply mentioned but not discussed. Some project samples downloaded from the publisher don't even work (they give an error message). After reading this book, I did not have a framework for a functioning database project. There are a lot of good free materials out there on this topic, so I would have expected a $40 book to have been much better. I could not recommend this book to anyone. This book is not just about the sqlite databases that you can use with Android apps out of the box. It also looks at some other data options and the various architectures around them. I am at the tail end of a project where I updated the data model of some legacy android code. I had a good handle on databases in Android but I still learned stuff here. The only con for this book is that by the end it's a little heavy on the tell you what I've told you theory of writing. It's not that terrible but I can't take off half stars.